Ready Player One: Geeks, Game On! The year is 2045 and video games are not just games. With the real world at its harshest now, people are escaping reality by living an alternative life inside a virtual world created by James Halliday (Mark Rylance)- the OASIS. Inside this world, players can be who they want to be or be what they want to be. Before his death, Halliday planted three quests inside the world he created. The first player who will obtain the three keys will earn the full ownership of the company and the fortune that comes along with it. Wade Watts (Tye Sheridan) plays his way as Parzival to this and thus takes us to a great adventure that is Ready Player One! The film started on a high bopping note to Van Halen’s Jump. I knew at this very moment that Spielberg is going to take us on a fun nostalgic ride. His film is based on Ernest Cline’s novel of the same title. The source material received raving reviews and even claimed it to be the “Holy Grail of Pop Culture.” Spielberg is the perfect choice for adapting the material into a film. He is acclaimed for creating thrilling adventure sequences and universe and in Ready Player One, it showed. In the the story, long gone are the days when games and reality are separated. People are now spending more of their time on the OASIS. Through the more advanced VR technology, players live out their real lives in the made-up world. What happens in the gaming world now has real repercussions in their actual lives. Halliday’s Easter Eggs made the stakes of the game even higher! With basically everybody living a tough life in poverty, winning Halliday’s game would mean a lot. Watts takes on the game along with his small circle of friends including Aech (Lena Waithe), Art3mis (Olivia Cooke), Daito (Win Morisaki), and Saito (Philip Zhao). This group of underdogs are just among the players in OASIS who are on the hunt for Halliday’s Easter Eggs, Gunters or egg hunters. Meanwhile, a corporation takes the hunt seriously and made a business out of it. The IOI, headed by Nolan Sorrento, will stop at nothing to take on the prize and monopolize the game. This aspect of the plot provided the conflict which, in hindsight, is a reflection of the real world at the moment. It creates a vivid mirroring of the commercialization of pop culture, gaming, and the internet. The film’s jab at internet ads and intrusive display pop-ups are too real to a point that I giggled. 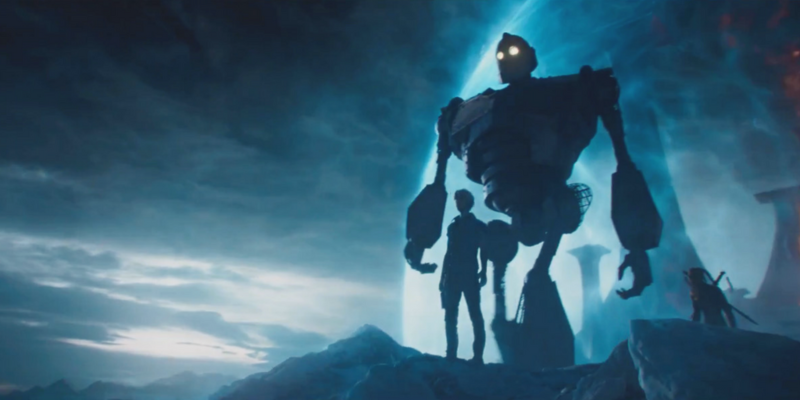 Ready Player One pleases pop culture fans with its references and loads of Easter Eggs. Almost every scene had one that spotting them can be a game on its own. Icons from the 80s and 90s were added to put the audiences up on a nostalgic ride. While seeing them pop-up on screen from time to time, I can’t help but wonder whether pop culture stopped in the 90s that no icons from the 2000s were referenced. Sure, there was the cheer-worthy sequence featuring the Iron Giant and Gundam but this glaring loophole is one that I cannot unsee. Either that’s the case or the more understandable studio property rights scenario happened. Halliday made the game for his Easter Eggs extra challenging with elaborate set pieces and worlds of their own. Spielberg was at his element in the film where the OASIS materialized greatly. The quests that the protaganists played created the illusion that we’re being taken in the actual video game that they were in. If anything else, the visual fantasy decorated with its pop culture references was a feast for the eyes! In true Spielberg fashion, the movie did not only please the eyes and take us on a great adventure, it also touched us with the heart of its story. Parzival and his friends were not only winning the game for the joy of it. They each have personal reasons that motivate them to find Halliday’s Easter Eggs. Well, aside from the fortune and prestige. Despite having a heart, some plot lines felt rushed and shallow. One for example is the romance between Art3mis and Parzival which they took out from the OASIS into the real world. The relationship between the characters reflected nothing more than just playmates, so seeing them as something more than that was a bit of surprise. Also, the conflict between Sorrento and Parzival felt dated with its good vs evil storytelling. I could not help but wish it had been explored further. With that said, these are only minor flaws as compared to the whole spectacle and immersive world that Spielberg had in store for us in Ready Player One. This is a film created by a fan for fans, geeks, and pop culture aficionados. Spielberg had a great understanding of the characters in the film and put it to great use. Trust me when I say that this film is more than just nostalgia and spotting pop culture icons. Also, is geekgasm a thing? Because I had it while watching Ready Player One. It was easily one of the most fun movie experiences I have had in a while! NEXT POST Next post: Here's How You Can Be at the Avengers: Infinity War Event in Singapore!